There is much to be said for a woman travelling alone in the world, in my case the Far Eastern side of the planet to the Philippines. As a demi-Filipina, one might assume I have a distinct advantage in navigating around the 7000+ island culture, versus the typical ‘tourist’ trip and indeed, I have visited it a few times throughout my life however always chaperoned and with itinerary set by others. Not this time though and I noted the reactions curiously when I mentioned my planned tripped to Coron, Busuanga was ‘alone’. Gasps were breathed deeply, questions of “Why ALONE?” cast and plentiful cautionary advice proffered (all to be taken with equal amounts of salt). Quite understandably though, if your disposition is reliant on the approval of others, you would probably reconsider travel plans to appease the natives. As a supposedly independent and self-sufficient female who manages well enough in London, this is not a situation I found myself at particular ease with. Being back in the Philippines after over a year seems finite time in order to resume service. But this is a posthumous trip, the last including the presence of my late Mother and has meant developing and gaining much responsibility (long may you wait to do so yourself). What had not changed though was the perception from certain relatives of being somewhat infantile, due to the cultural side within the Philippines being so focused on a hierarchal system that it is can be difficult to gain a sense of autonomy from the core security of family. Add a deeply religious upbringing to this and you can start to comprehend the mind-set of this heritage. Coming from Western civilisation though, I am quite aware of the freedom I have enjoyed and the creative gifts that I am (and continue to work on) honing. 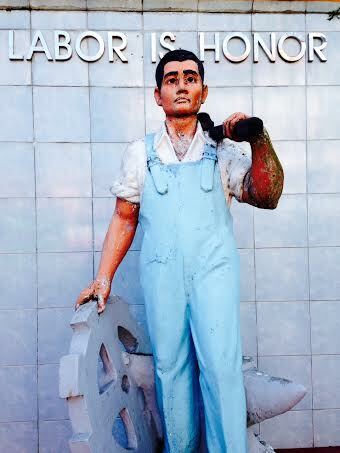 ‘Labor is Honor’ was the slogan above a statue’s head in Iloilo City and this is a motto most Filipinos live by. The need to support and secure your family through the usual reliance of honest hard labour with trades ranging from medical to teaching are respected and understood. They bring the wages on the table and feed the mouths that grow and repeat the cycle. Creative trades from Music to Media are not ‘quite’ as understood due to the inconsistency of income. Describing what I do on a daily basis is not something immediately fathomed by my family and can only be nodded to when a schedule is explained or the conforming ‘9-5’hours specified (regular work). Having wide geographical links and being a cultural mix, I have become acutely aware as I’ve got older to ensure I adapt to the locations I am, although it is not always a mutually reciprocated situation. So after over 2 weeks of family time in well visited areas, I was eager to sate my wanderlust by flying to the island of Coron. My planning for this trip had started almost a year ago and through a family member of my own, I had been put in touch with a local resident who in turn put me in touch with another local. Independent travels are what this is all about I suppose; hustling to survive and pulling in contacts. So before I arrived I had a room reserved at a good lodging and a contact in the form of the fair Filipina Marichu to message on arrival. Prior to departure, my family were all very concerned, particularly the elders. Whilst I understood the intention, it only plants seeds of doubt in one’s mind. I was advised not to trust anyone, to lock my doors, keep my bag close and avoid going out anywhere at night. In Kalibo and Iloilo where I had previously been, these words had already been instilled so I tended to avert my eyes and speed through localities but not this time. 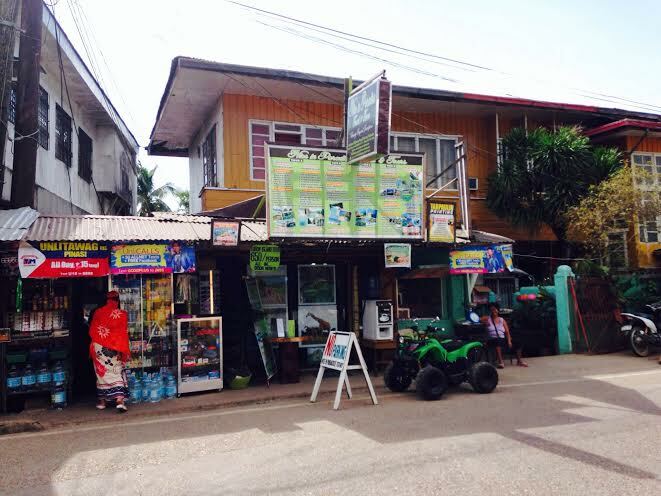 As soon as I arrived at Busuanga Airport, a sense of relief descended as I opened my eyes once more with the child-like curiosity I had been censoring. The perspective from the plane of the uncharted territory made my eyes widen as I peered from my window seat, staring in awe at the cluster of islands below me. My hotel had previously texted me the day before to confirm my airport shuttle pick-up which costs 150pesos to ferry myself and other hotel residents to the door. We drove through the single road that ran like a vein through the 360 degrees of vegetation, watching the life flow in and out. Greeted by the ever hospitable Filipina desk staff (‘Hello MAM’ ) at the Sea Coral Lodge Hotel, my tick-list was swept through perfectly; clean room, good wifi, hot shower. Upon contacting Marichu who met me outside, I hopped on the back of her motorbike and we took off into the sunset towards the harbour waters nearby. As I gazed euphorically at the pinks and golds swirling through the mountain tops, completing the picture with local boats and the gentle shimmer of the sea and wishing certain others could witness this same moment, I experienced such serene happiness. Bats flitted excitedly in the air as the sun continued to set and a tourist who also took a photo commented to me ‘It’s pretty, ain’t it?’. It sure was. 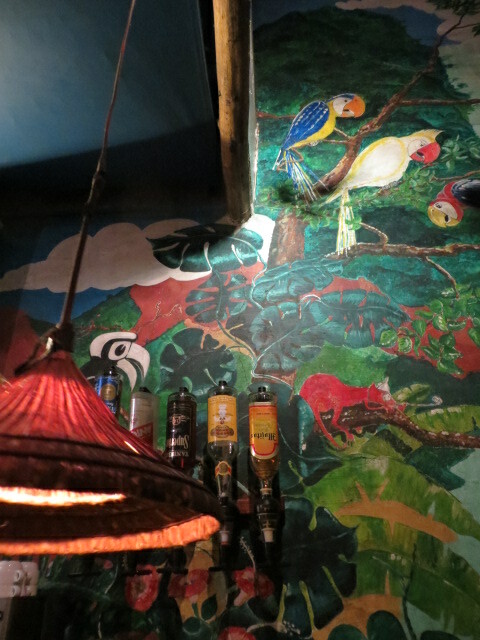 The tour came via ‘Nice in Paradise’ (they do love their catchy names) and was recommended by Marichu the night before. I booked the ‘Highlights’ tour which incorporated 6 destinations,ensuring a full day that started at 8.30am: Kayangan Lake, Twin Peaks Reef, Banol Beach, Skeleton Wreck, Cyc Beach and Balinsayaw Floating House. 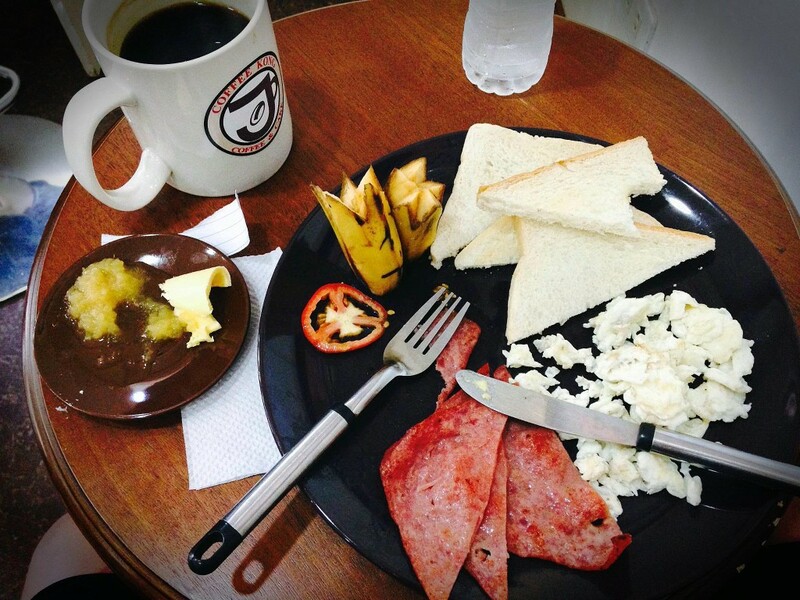 For the total price of 650 pesos, lunch is also included and bottled/filtered water throughout. Snorkelling mask can be hired for only 150 pesos (just be careful not to lose any part of it as the tubing is 500 pesos to replace. Add another 1000 pesos for the mask too). My companions on the boat were all pairs comprising 2 Polish, 2 Russian, 2 Filipina, 2 Chinese (a particularly endearing couple whose male counterpart entertained the boat highly throughout the day with bursts of song and sage knowledge) and 2 Americans. 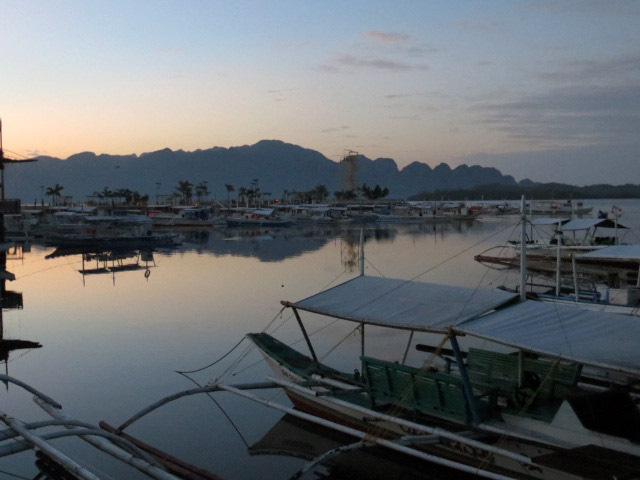 A healthy mix of global population and vagabond footing set us up nicely for interaction as we departed Coron Bay navigated expertly and safely by the tour staff headed by the jovial Larry and Marc. 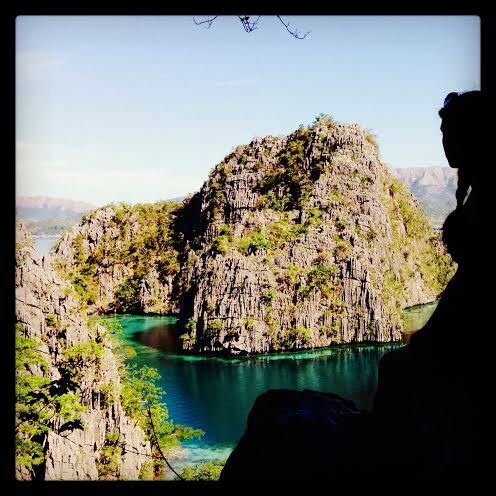 Photos, cinematography and spoken word can only be secondary to the real life experience and it applied in every sense to our arrival at Coron Island. As our boat zoomed in on the mountainous landscape looming ahead of us, everyone was silenced by the sheer natural splendour which quite literally took our breath away. Not a house or commercial influence in sight, just Mother Nature in her full glory and I had to keep pinching myself when we docked to check I was not dreaming. A walk up a steep incline of about 150 steps (be careful though, it’s less about fitness, more about awareness of jagged rocks) brings you to a viewpoint that transcends the arrival. I commented frequently on how astounding the whole situation was, gazing at a view that as I reflect back upon would question it’s reality (had I not taken so many pictures) due to its ethereal perfection. 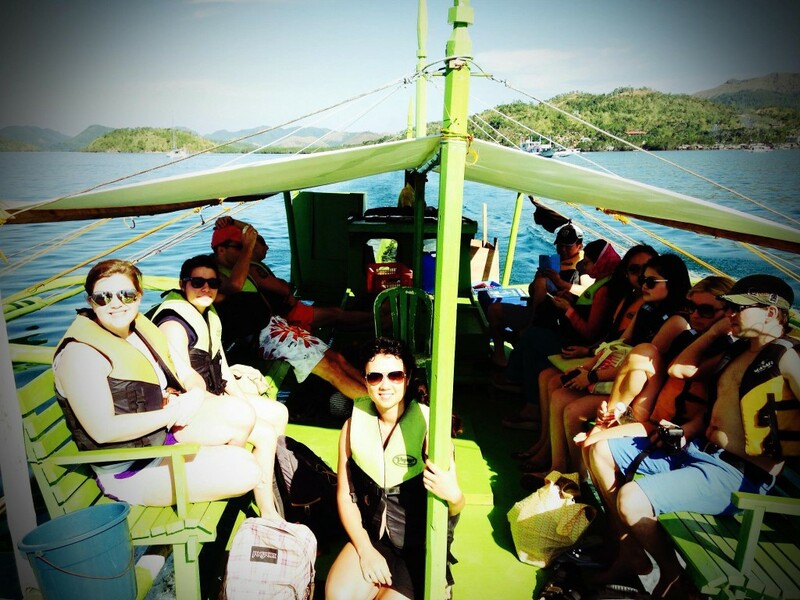 We descended down the opposite side, met by the enormous and stunning Kayangan Lake of clear, warm waters. This lake is supposedly dubbed the cleanest in Asia and until I see otherwise can verify that rumour. I paddled around quite giddily, going as far out to the middle where not a sound could be heard except the splashes of other human limbs in the lake and the occasional bird call from the surrounding forest. A magnificent moment to pause, tread water and ponder. A small pair of rocks may seem the norm in the vicinity, but this spot was surrounded by beautiful coral reef and many tropical fish where the good use of snorkel gear can be applied. A fond memory for myself included a vast shoal of fish inducing laughter as they nibbled the leftover food from my fingers. Many shallow waters of reef to bob around and admire, just avoid the sea urchins. The epitome of classic white sands that distinguishes the beach life of the Philippines from so many others, lunch was served here as we pulled up for some much needed marooned time. 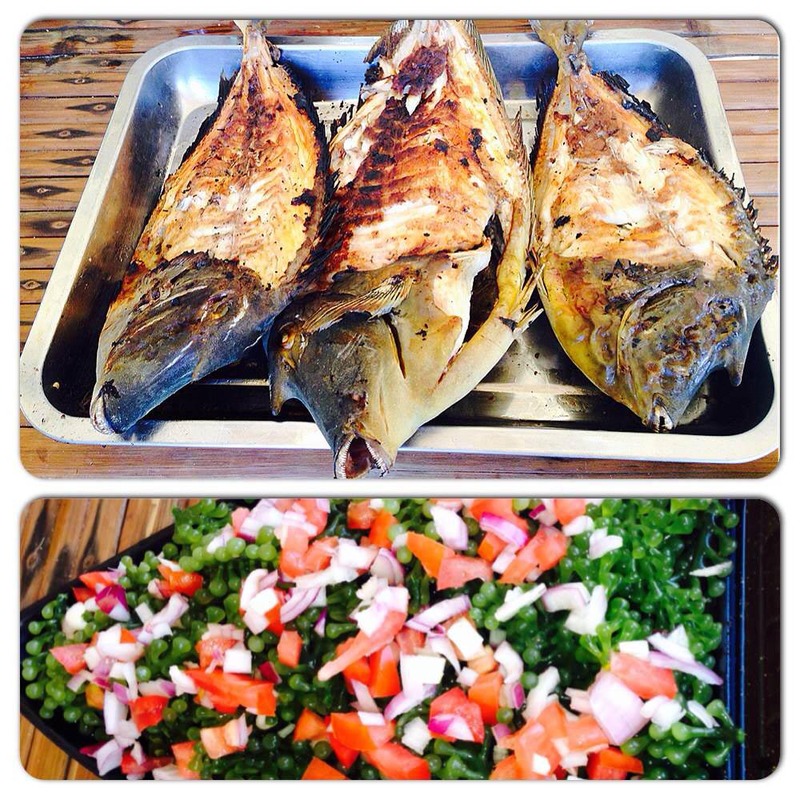 We were treated to a feast of Grilled Unicorn Fish (aka Naso fish), Grilled Pork, fresh seaweed salad, rice and fresh fruit. The glorious beach was only occupied by some of the Tagbanua people, one of the oldest ethnic groups in the Philippines having arrived to these shores themselves over 5000 years ago. A self-sufficient community indigenous to Coron, they maintain their traditions and environment admirably, away from the mainland Philippines which is certainly more and more riddled with commercial (and less environmentally friendly) influences. In 1944 a group of Japanese ships were sunk by American warplanes in the Coron waters, whose ghostly vessels now rest within the depths of surrounding islands. 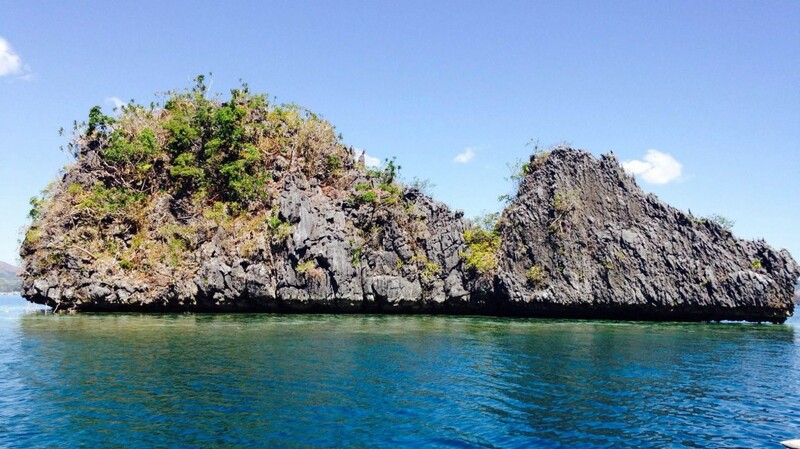 These relics now provide much attraction, making Coron one of the top dive sites in the world. I could merely bob above the mysterious wreck that we had been brought to, peering through my misty snorkels underwater to gaze at the dissolving light shards that drifted through the peaceful naval carcass. If you do not dive already, you will certainly want learn when such antique treasures are within reach. 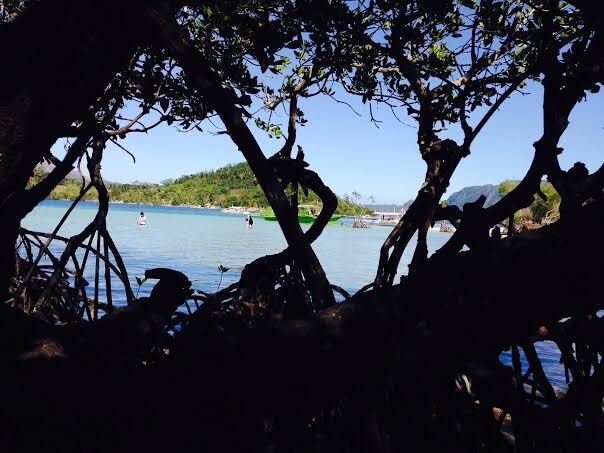 CYC Beach (shortened from Coron Youth Club) was another white sand beach, framed with artistic mangroves on its edges. 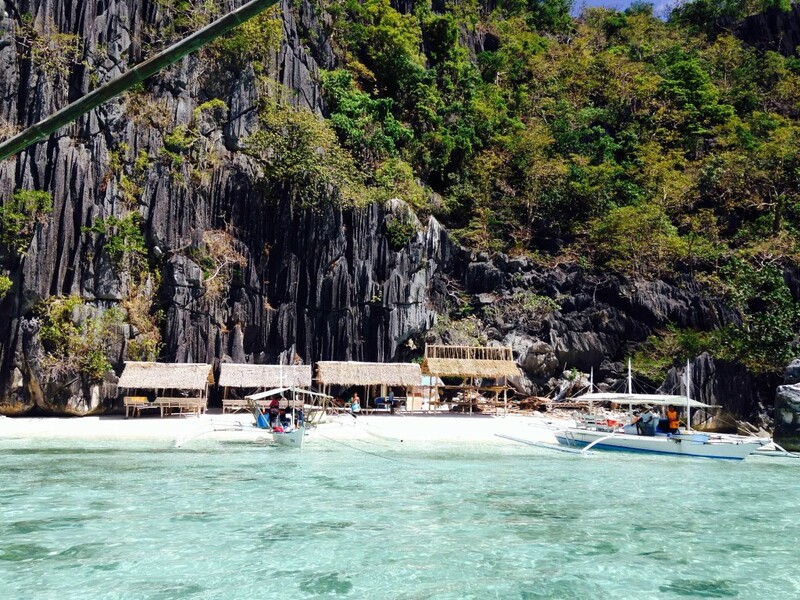 This used to be considered the best beach in Coron however I would have to side with Banol on this occasion. There is an incredible almost 360 degree view to also take into account when you arrive on shore, giving you a gorgeous panoramic shot of the paradise that you are standing on. Last stop on the itinerary, we were brought to a floating bamboo hut to moor and exercise off the remains of lunch. 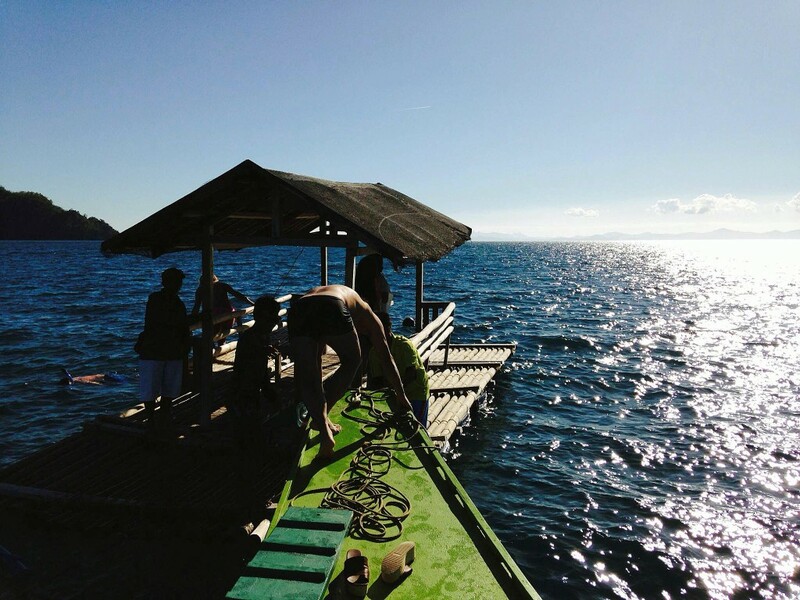 Balinsayaw Resort is in the distance and is a secluded selection of private huts where for the price of approximately 6000 pesos a night you can withdraw from the rest of the islands, only to be administered to by the attentive staff. Whilst desolate and beautiful, it seemed to be a bourgeois venture to stay at such a resort when the stunning surroundings were already gratis and with my perfectly adequate digs on the mainland for the more reasonable price of 1200 pesos per night, the saving you make could be spent on many other delightful excursions. Be careful not to scrap your leg on the floatation tanks under the huts though. Aside from an unfortunate graze, your mind will plague you with the Jaws theme when you ponder the fresh wound in the deep waters and decide to climb back on board instead. Compared to Boracay Island that I had ventured to the week before, teeming with souvenir shops, masseurs and mobile ‘everything’ sellers (you will eventually bore of the on-the-minute sunglass, hat and pearl traders), Coron has substantially less human traffic which I mean most affectionately as it allows you to absorb the surroundings more. I was lucky to take family vacations to Boracay in its formative days and fondly remember a beach front overnight stay, where I braved the mosquito population to sleep outside, able to gaze at sunset and sunrise from the comfort of a hammock and all in relative isolation. Now the ears are constantly exposed to commercial pop and invites for ‘Lunch Mam?’ or ‘Massage Mam’ which for myself sadly lessens my longing for Boracay visits (although a top tip I can give is go to Station 3 as this is more in-keeping with the days of yore). Souvenir shops produce lovingly made local items of wonderful value so you can happily bring back some pieces of paradise for those who could not join. 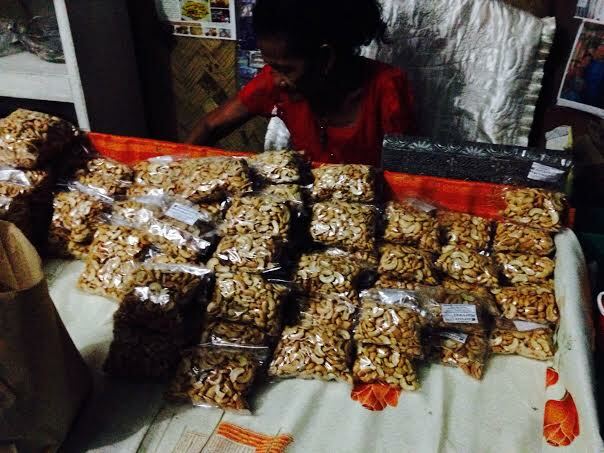 Cashew nuts are prolific in Coron and you can buy a selection of flavours from local suppliers such as the infamous L.Escarda’s Coron Harvest ranging from plain toasted to Bandi (cooked in a traditional method, sweetened and caramelized with a hint of coco) or many other roadside proprietors (the Filipinos are excellent snackers). Alligators are synonymous with Palawan too (although I did not cross paths thankfully) and influence the merchandise, as well as the Tahbanuan tribal influences with wooden masks and figurines. Mount Tapyas provided some continued welcome exercise and I ignored suggestions to avoid the 700+ step climb in the midday heat (I am a stubborn one). 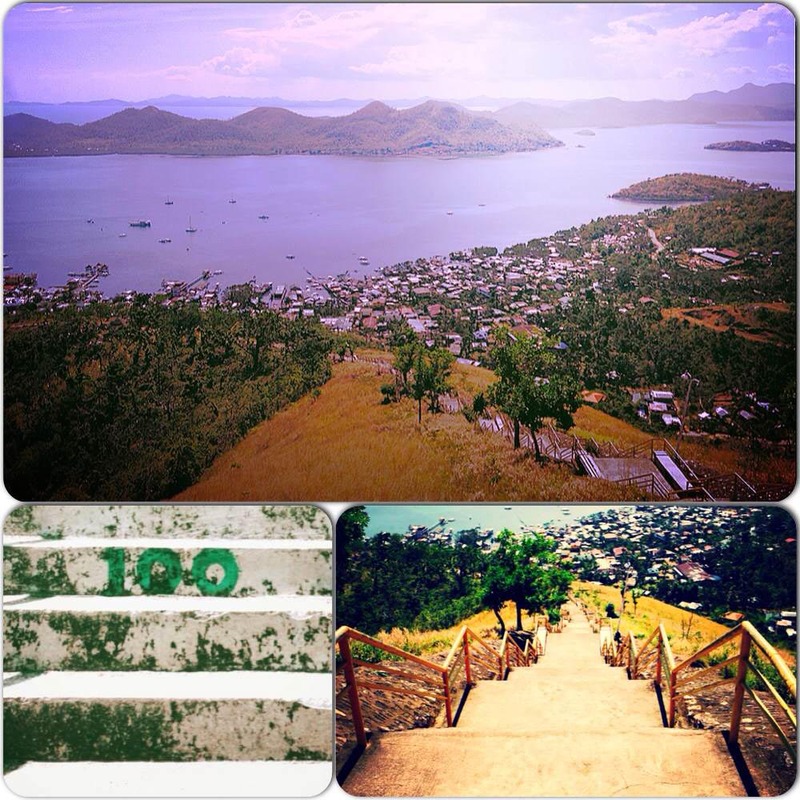 Upon reaching 100 steps after an already steep incline from the main street (some take a tricycle to the bottom of the stairs to ease the limbs), I only had to turn around to remind myself that the other 600 steps would be entirely worth it. Not a soul passed me by on the journey aside from considerably less bouncy workmen doing their best to stick to shade. As I reached the top and gazed out upon the incredible view, I did become quite aware after a few moments that I was entirely alone and being gazed at by a local workman in a tree not too far aware so my sensible side decided to take a couple of photos but then venture back down toward habitation (I am not suggesting anything perilous could have happened but as a lone female one should be wise to the possibility). Manquinit Hot Springs provides much respite after a long walk up a mountain, so at Marichu’s suggestion, we boarded her motorcycle to end the day here. For an entrance fee of 150 pesos, you have access to the geothermal natural bathtub, one of the few saltwater hot springs in the world. A mangrove forest surrounds the waters that can reach up to 40 degrees Celsius, which I wish I could have seen during the day. Once again, another trip needed however I was equally content laying star-fish like in the water whilst gazing up at the crystal clear constellations in the night sky. One of my other great pursuits in life aside from travel is satisfying my appetite for FOOD and you will be pleasantly indulged with excellent choices of establishment on the island. I merely touched upon what was on offer but these were spots that I will certainly return to. A popular choice with tourists as well as locals, La Sirenetta offers a wide variety of choice, mainly sampling a more European palate with pizza, pasta and salads on the menu. 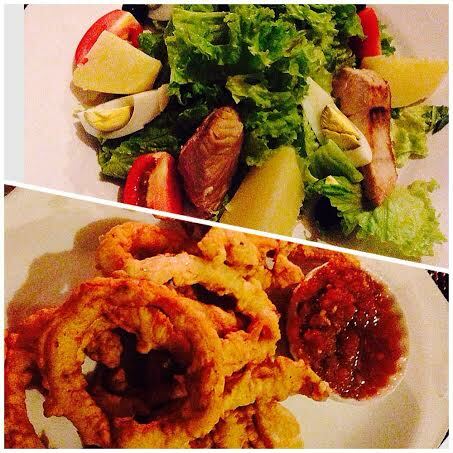 I enjoyed some Calamari which was served with a deliciously spicy sauce (I have firm standards with the term ‘spicy’ and it met them), hummus with pitta strips and chased with a Chef’s Salad of freshly grilled tuna that I perhaps did not need but thoroughly enjoyed. 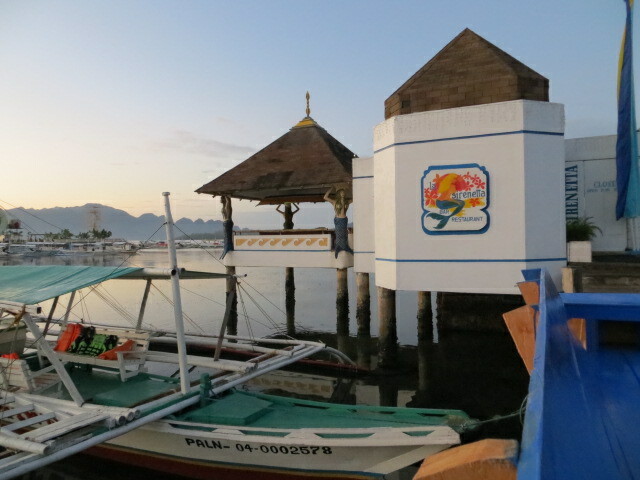 They have a thorough list of drinks and cocktails too (a signature bright blue Mermaid Margarita will soothe any sweet tooth), all to be supped slowly whilst overlooking the boats in Coron Bay. I was recommended this spot on the first night (found just off from the open Coron Market area) however it was impossible to get a table, mostly occupied by multiple local Korean families enjoying their cooked produce from the local markets (a nicety that the Filipino/Chinese run business offers, allowing customers to bring along fresh crab and lobster to be cooked up by the chef in a steaming fragrant coconut based broth). 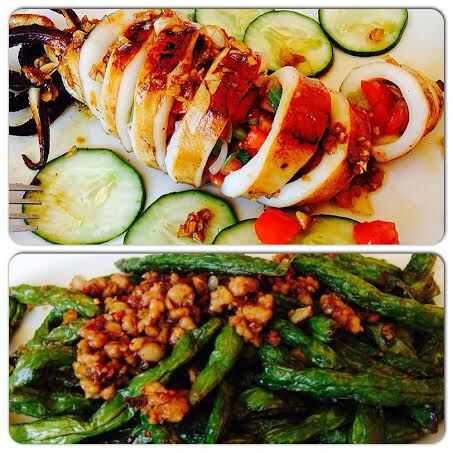 I found it much easier coming the following day for a lunch table for one and enjoyed an incredible stuffed squid special, filled with chopped tomatoes, spring onions, ginger and spices. I enjoyed these with some Four Seasons green beans which are fried with minced pork in a garlicky, soy sauce based drizzle. I ate up everything from top to tentacle and ensured admiration was expressed to the chef (who turned out to know a friend of my family. Everyone eventually knows everyone in the Philippines it seems). 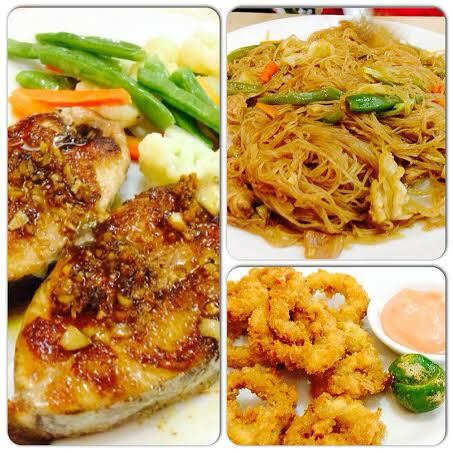 After conversing a short while, the Chef invited me back in the evening with a promise of table guarantee and I did indeed return with my companions Marichu and her daughter Cheena, enjoying further sustenance from some delicious fish, pancit (Filipino style noodles) and (mandatory) calamari. Highly recommend but be patient for a table. The staff will oblige as best they can but any table you tire of waiting for will be easily snapped up by a wise local. Simply named, Bistro Coron is a few doors down from the Sea Coral Lodge hotel and offers an incredibly large menu with everything from sandwiches, pizza and salads (once again indulging the international clientele that manage to visit). 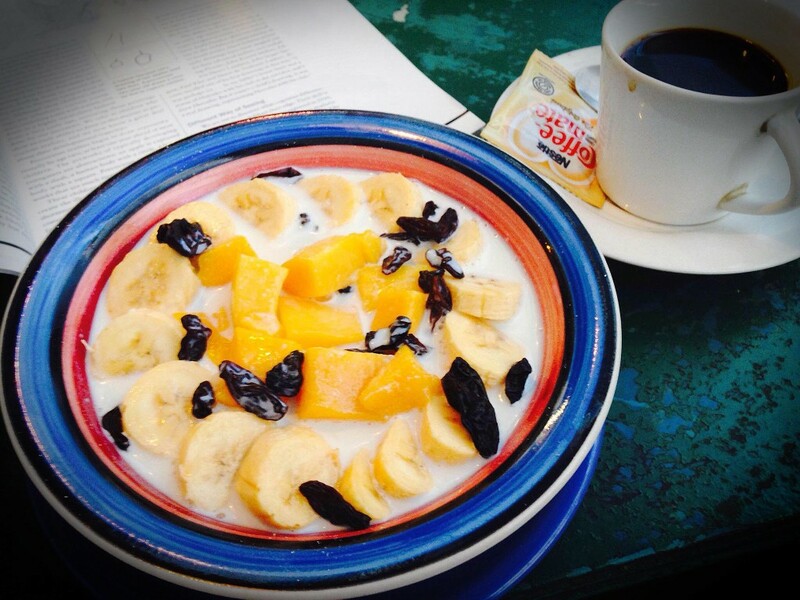 Whilst I did not get to try any savoury food, I did enjoy a simple muesli breakfast with fresh banana and mango (I implore that you eat copious amounts of mango whilst in the Philippines. This is a signature fruit there and incomparable in sweet fragrant flavour that you will yearn for them well after departure). A lovely place to come for an evening drink too and wind down after a day of much activity. After my mountain trek to Mount Tapyas I stopped by Ice Valley which serves up various combinations of a Filipino sweet treat Halo Halo. Translated as ‘Hodge-Podge’, it really is a swirl of ingredients, combining shaved ice and evaporated milk with fruits, sweets, red beans and cornflakes. Whilst perhaps a tad pricier than the average halo-halo, there is free wifi and air-conditioning that provides a brief escape from the intense sun. 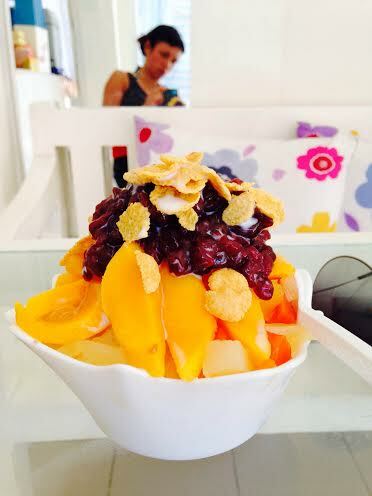 I quite adore this dessert but if halo-halo is not your thing, you can enjoy a fresh shake or frappe instead. Currently the only ‘coffee shop’ on the island, it is an enterprising spot for that reason as many a tourist covet it for its wifi connection and varying mug sizes of rocket fuel. Coffee here comes how you would expect in more Western territory, so there is a certain comfort in knowing a cappuccino is attainable (versus the usual 3-in-1 satchets of Filipino coffee that is more common). All the usual accompaniments can also be granted, with some baked muffins and danishes on offer, as well as varying choice of breakfast. I chose an American Breakfast which satisfied me well enough, with a few strips of bacon slivers, scrambled eggs and toast with a scraping of pineapple jam. Staff are friendly and hours are long so you can maintain some contact with the outside world (should you wish). I take great pleasure now in pausing to drift into memories of reaching this wonderful island. The landscapes and views are ingrained in my mind and I smile profusely when I remember motorcycle rides at night, gazing up at the night sky shrouded in a veil of glittering stars, with only the sound of crickets and flitting bats in the warm breeze to coerce out of the trance you could easily drift off into. You may read of a multitude of international island attractions, tourist spots that I’m sure have their own charm and glory that should indeed be visited. I cannot comment on them though as I have not been. Yet. 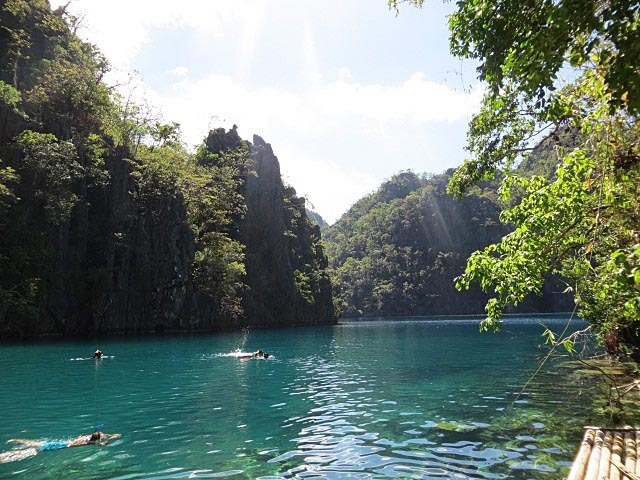 I can comment fully on Coron however and it is certainly one to return to. If you do come, respect its lifestyle though. There are no malls, there is no late night party music and there is minimal chance that you will be bombarded by traders. 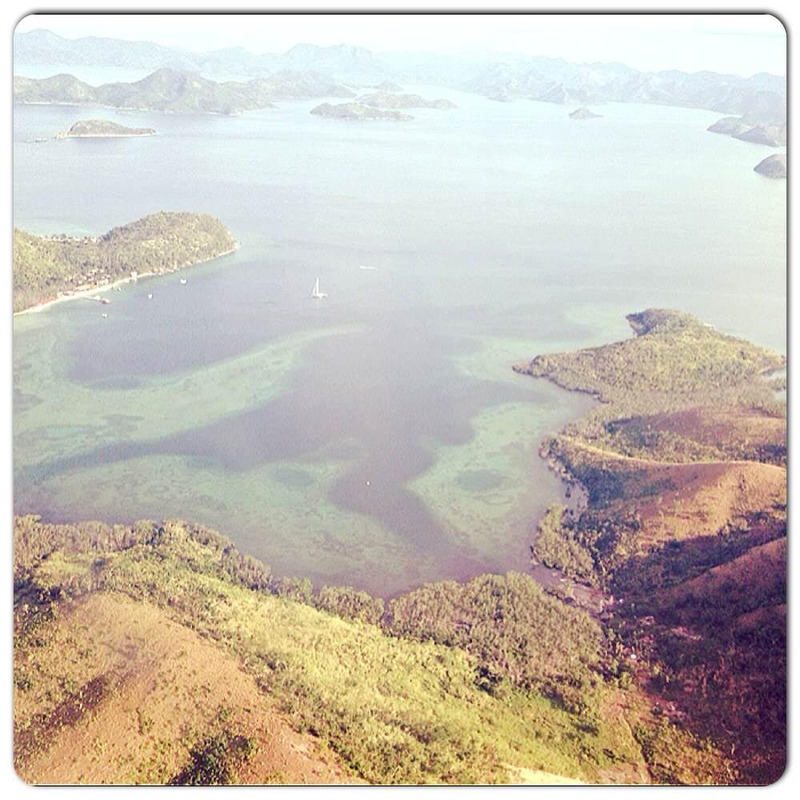 So enjoy these rare exemptions as you revel in the peaceful, beautiful splendour that is Coron, Busuanga. With Special Thanks to Rechel, Bess & Marichu for making this adventure possible.